Tomorrow will be a big day for the New York auto show as journalists get to spread the word and exclusive images on some of the latest and greatest automobiles for the 2013 model year and beyond. One vehicle that has leaked onto the internet before its official debut at the 2012 New York Auto Show is the highly anticipated 2013 Nissan Altima. The new 2013 Nissan Altima touts astonishing fuel economy figures of 27 mpg city and 38 mpg highway making it the best in its class. Part of this major accomplishment is due to the re-tuned 182-horsepower 2.5-liter 4-cylinder engine with variable valve timing. Other contributing factors for the best fuel economy for a non-hybrid midsized sedan are the new generation Continuously Variable Transmission (CVT) and lightweight construction. The new 2013 Altima sits on virtually the same wheelbase as the outgoing model but gets slightly larger body dimensions. The new 2013 Altima also managed to shed about 79 pounds over the 2012 model. The same 3.5-liter VQ series V6 engine is a carryover from previous V6-model’s boasting 270 horsepower and 258 lb-ft. of torque. Having the new CVT unit, with reduced friction and extended gear ratio ranges, allows Altima V6 models to muster out 22 mpg city and 30 mpg highway. Pricing for the new 2013 Nissan Altima will start at $21,500* when it arrives at dealerships in July. There is no doubt that the midsized sedan segment is quickly evolving and remaining quite competitive. Nissan plans to stay ahead of the game with the introduction of their new 2013 Altima in terms of efficiency, simplistic interior design, value and performance. I am sure with recent sales records set by Nissan that they will continue to be a major player up against others such as Toyota, Honda, Chevrolet and even Hyundai in the midsized sedan segment. 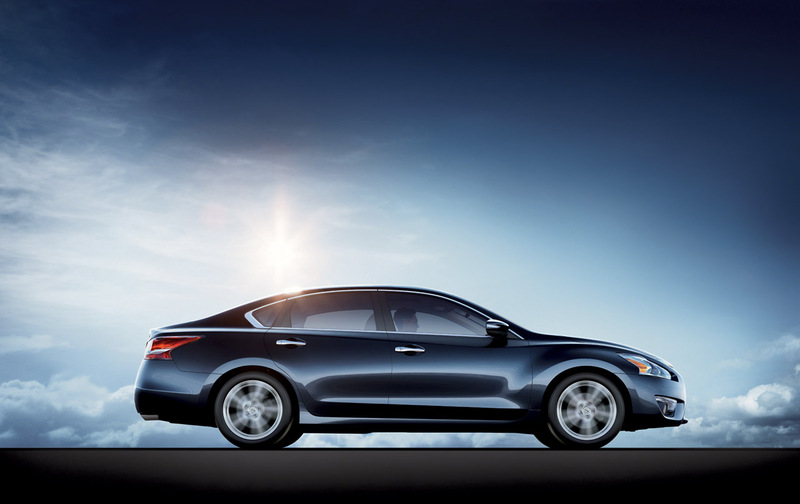 Hit up the full press release below for additional information on the all-new 2013 Nissan Altima. Two decades after the original Nissan Altima revolutionized the traditional mid-size sedan segment in North America, Nissan’s best-selling vehicle is about to shake up the category all over again. Making its world debut at the New York International Auto Show, the 2013 Nissan Altima is once again poised to become the new benchmark in the hotly contested segment when it goes on sale at Nissan retailers nationwide this summer. The 2013 Altima is one of five all-new Nissan models set for introduction in the next 15 months and, as the second best-selling car in the United States in 2011, much is riding on the new fifth generation Altima. The result is a vehicle that builds on the strong fundamental reputation, earned over four generations and two decades, for quality and reliability and adds new levels of innovation, fuel-efficiency, dynamic performance and premium style. Among the new Altima’s many new features, perhaps the one that stands out most is its “class above” appeal, which is apparent at first look and first touch of both the exterior and interior executions. The 2013 Altima’s all-new exterior design starts with its wide, aggressive stance and dramatic front end styling. Though retaining the same wheelbase as the previous generation Altima, it has a wider front and rear track (+1.4 inches) and deeper fenders (+0.8 inches each side) – which combine with a crisp new grille design, seamless bumper and projector-type headlights to create a bold, sophisticated appearance. Altima’s new “premium proportions” continue with the longer sloping rear roofline and raised trunk that combine to create a more fluid silhouette. The A-pillar angle is now slightly more sloped, and the drip rail has been lowered and the waistline raised. In addition, the deep-stamped trunk has been raised and expanded. The new body design is capped by large taillights (with LED taillights standard on SL models) that flow from the rear into the bodysides. Chrome trim and door handles accent the available palette of eight rich exterior colors. Attention to aerodynamic fine-tuning gives the new Altima a lower coefficient of drag. The new Altima’s interior defies mid-size sedan convention, rivaling upscale luxury sedans in ambience and sophistication. Like the exterior, there is a premium look and feel – from the driver’s side cockpit to the front passenger and rear seating areas – with extensive use of upscale, soft-touch materials and craftsman-like attention to detail. “The new Altima’s interior offers just the right balance of mature sophistication with a highly dynamic and emotional edge. It’s refined, not gimmicky, with features that you’d expect to find on a much more expensive vehicle,” said Carolin. 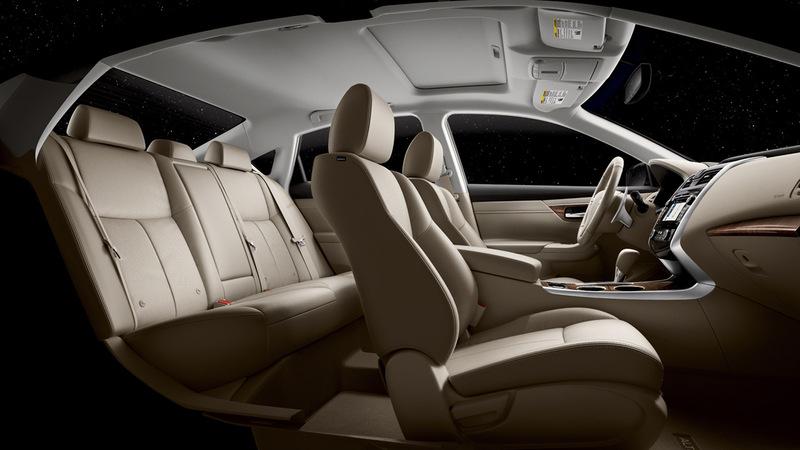 In the desire to help reduce the fatigue experienced during long commutes or extended road trips, Nissan turned to seating and posture research from the National Aeronautics and Space Administration (NASA). According to NASA, the least fatiguing seats are those that come closest to a “neutral posture” – a relaxed position that the human body takes in a weightless environment. Utilizing a new articulated seat shape with continuous support from the pelvis to the chest and distribution of localized deformation characteristics, the “zero-gravity” Altima seats help reduce muscular and spinal loads, and improve blood flow – thereby helping reduce fatigue over long periods behind the wheel. 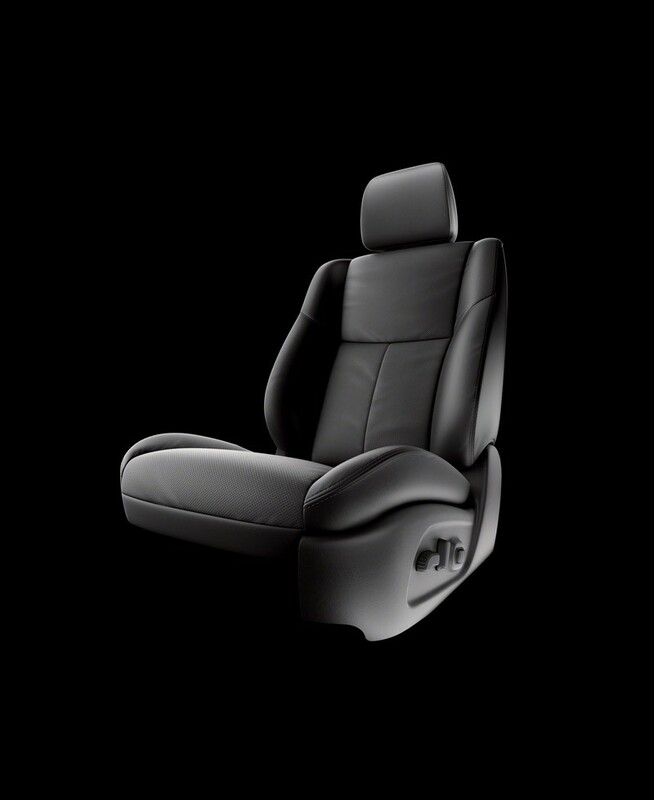 Seat surface perforations provide increased ventilation, breathability and comfort. Heated front seats are also available. “Reducing driver fatigue is something that shouldn’t be limited to luxury vehicles, especially as Americans are making longer commutes and looking for alternatives to flying for business trips or family vacations,” said Carolin. Along with premium seat comfort, the new Altima offers premium quietness through efforts to reduce cabin noise coming from the powertrain (new engine and exhaust mount designs), climate system (increased HVAC mounting rigidity) and the body (increased body rigidity) versus the previous Altima design. New noise absorption materials with a 30 percent increase in absorption capability (versus previous Altima) are also used throughout the cabin, including areas such as the roof trim, instrument panel and floor mats. The 2013 Altima offers standard cloth seating with a 6-way driver’s seat and a 4-way adjustable front passenger seat, 60/40 split folding rear bench seat with armrest, and Piano Black interior trim with chrome finish accents. Also available, depending on model, are leather-appointed seats and trim, 8-way power-adjustable driver’s seat with power lumbar support, and metallic texture (Charcoal interior) or wood tone (Blond interior) trim finishers. Available audio systems include an AM/FM/CD design with RDS, MP3, aux-in and six speakers, along with a BOSE® Premium Audio System with nine speakers (including woofers), designed in conjunction with BOSE® engineers during vehicle development to deliver rich sound and acoustics. The new Altima is available with SiriusXM™ Satellite Radio (SiriusXM™ subscription required, sold separately), and Pandora® radio capability (requires capable smartphone). “With its range of available audio features, the quiet Altima cabin is an ideal place to enjoy various music collections – whether you plug in your iPod®, sync with Pandora® to explore new tunes, or let someone DJ from the back seat with Bluetooth® Streaming Audio,” said Carolin. 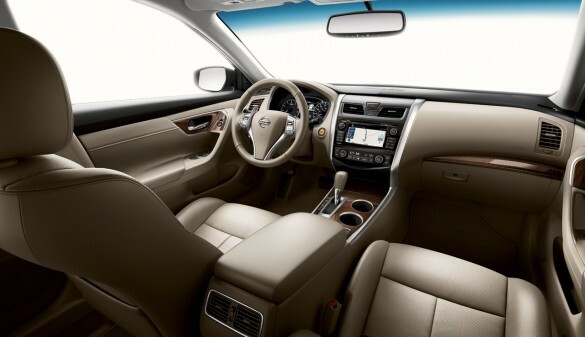 Along with the new seat design, two other items that set the 2013 Altima apart are its new NissanConnectSM and Advanced Drive-Assist™ Display (ADAD). 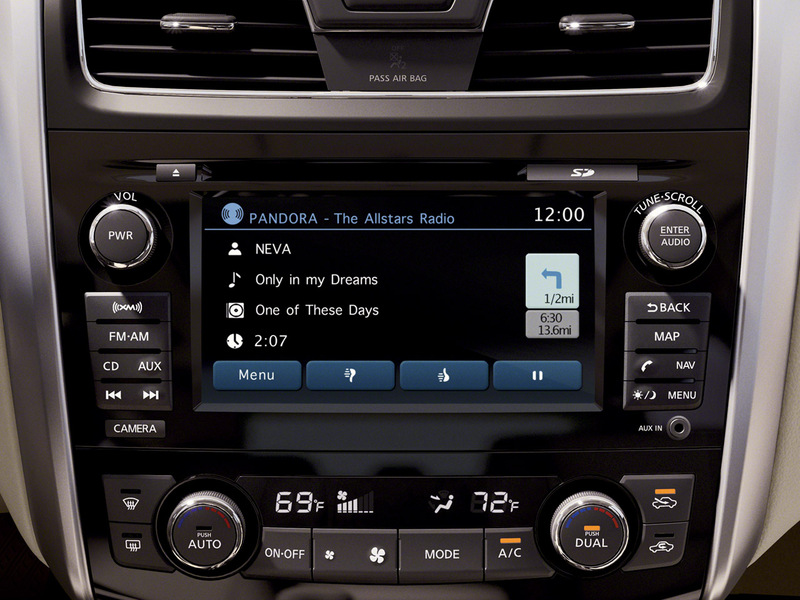 The 2013 Altima is the first Nissan vehicle to offer NissanConnectSM, which offers Bluetooth® Hands-free Phone System and Streaming Audio via Bluetooth®, along with available integrated Hands-Free Messaging Assistant, Pandora® integration, USB connection for iPod® interface and other compatible devices and SiriusXM™ Satellite Radio (SiriusXM™ subscription required, sold separately). It includes a 5.0-inch color audio display with SV and SL models. 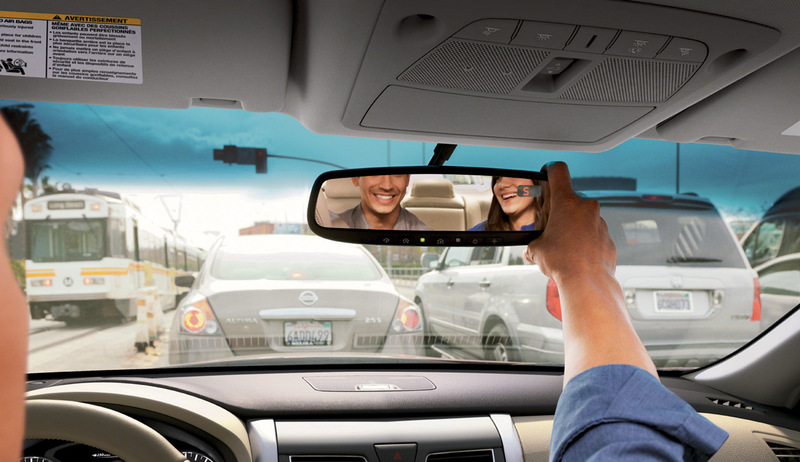 With the available Hands-Free Text Messaging Assistant (part of NissanConnectSM), drivers can manage incoming text messages via voice control without taking their hands from the wheel or eyes off the road. Drivers are alerted to an incoming text and, after initiating the system, can hear the text read out loud and respond via voice recognition, or via the steering wheel switches using pre-set answers such as “driving, can’t text,” “on my way,” “running late,” “okay” or a custom message. 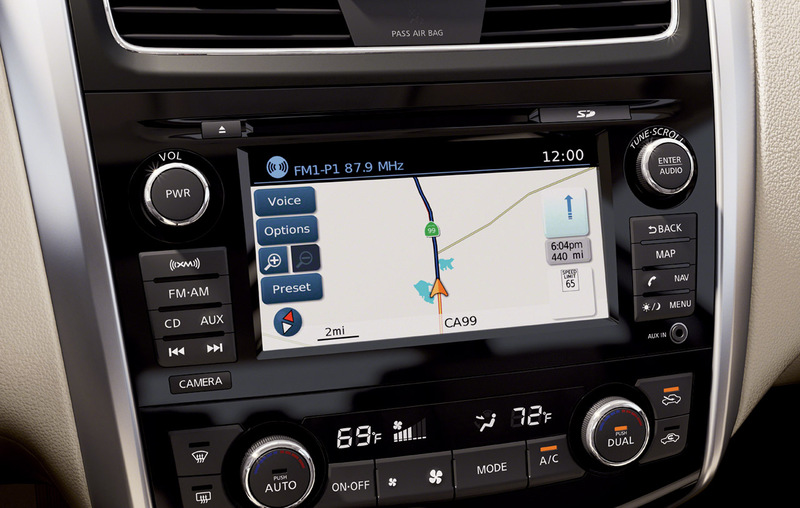 The NissanConnectSM with Navigation system is similarly packed with a rich range of features and is incredibly easy to use with its 7.0-inch touch-screen, 3D-effect map views, Voice Recognition, and turn-by-turn navigation integrated into the Advanced Drive-Assist™ Display. With the ability to search destinations via Google®, POI data will never be out of date. Other new next-generation navigation features include speed limit display, eco driving maps, curve warning, and split-screen display. The new Advanced Drive-Assist™ Display comes standard on every model and is customizable, easy-to-use and integrates key information right in front of the driver. Located in the center of the instrument display between the tachometer and speedometer, it features a 4.0-inch color display, more than 400 percent larger than the previous generation Altima’s vehicle information display. Utilizing more natural 3D-effect graphics, it helps the driver to keep his or her eyes on the road longer than a traditional center-stack information monitor. The ADAD’s color LCD screen displays are similar to those used in portable consumer electronic devices, with cognition enhanced by the depth and tilt of the display. Three screens are always available (CarView, Vehicle Settings and Active Vehicle Warnings) and the driver can also select four other active screens among seven other available screens. 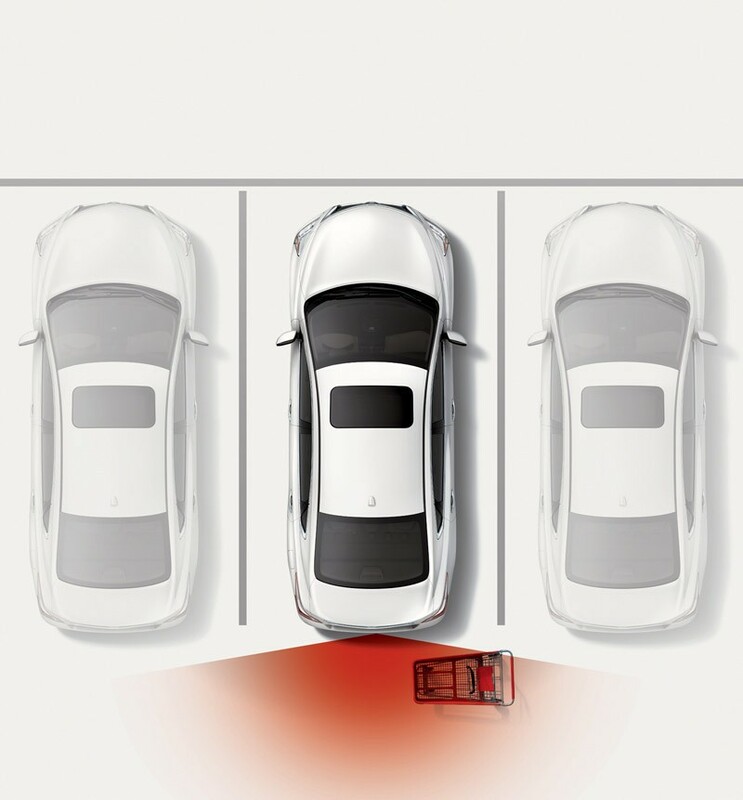 On vehicles equipped with NissanConnectSM or NissanConnectSM with Navigation, the Advanced Drive-Assist™ display shows navigation destination turn-by-turn information, Pandora® song information and more. In addition to its many other functions, the Advanced Drive-Assist™ Display can be linked to three new available safety features – Blind Spot Warning (BSW), Lane Departure Warning (LDW) and Moving Object Detection (MOD) – typically offered only on more upscale vehicles. It is the first time that LDW and MOD will be offered in the segment. The three systems are part of the optional Technology Package, which also includes the NissanConnectSM with Navigation with 7.0-inch color touch-screen and steering wheel navigation system controls. Thanks to the use of the systems’ advanced, next-generation rearview camera, the BSW, LDW and MOD are integrated, intuitive and affordable. 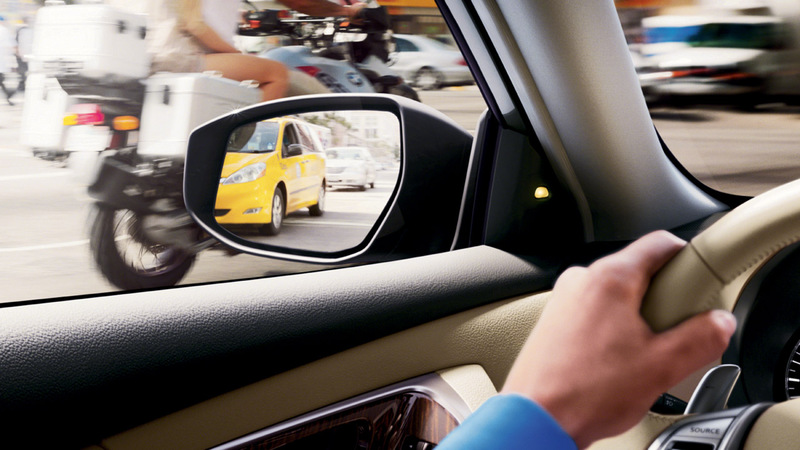 The Blind Spot Warning System uses the rearview camera to scan the Altima’s blind spots and alerts the driver if there is a vehicle in the zone. The driver is then alerted with audible and visual indicators. 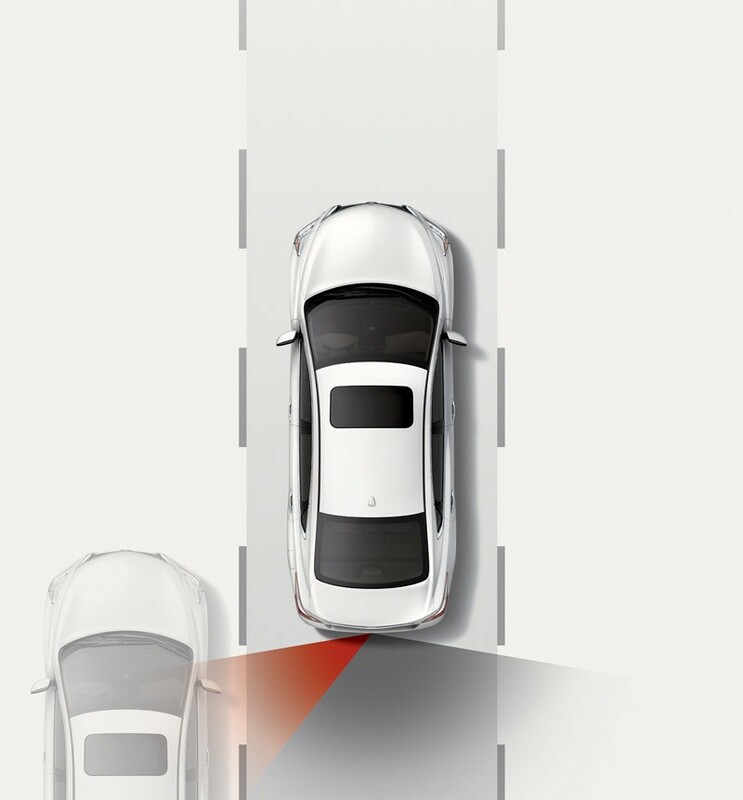 In the same way, the Lane Departure Warning system uses the rearview camera to monitor lane markings and alerts the driver if the vehicle unintentionally crosses these markers. Moving Object Detection detects moving objects, such as other vehicles, when the rearview camera is engaged when backing up and warns the driver with visual cues. “Like so many other features on the new Altima, these Safety Shield Technologies are designed to help ease the anxieties of daily life. For example, parallel parking outside of school, the camera not only helps you see backwards, but also has moving guides that help you into tight spaces. At a busy shopping center, the camera can give you a 180-degree view side-to-side and the MOD system can help alert you to movement when backing out,” said Carolin. “And getting on a freeway, A-pillar mounted light indicators, along with audible beeps, let you know if there’s another vehicle in your blind spot. We’re proud to offer these segment-first technologies to Altima owners in keeping with the true spirit of ‘Innovation for All.’ At Nissan, we believe these features should not be restricted to just premium vehicle buyers,” he continued. “Dynamic Performance, defined as excellent handling, driving confidence and driver excitement, has always been a part of Nissan’s core values – from the early Datsun 510 sedan and 240Z sports car to today’s 545-horsepower Nissan GT-R. Where the innovation comes in is in being able to offer fuel economy and responsive acceleration without compromising either,” said Carolin. One key to achieving this modern one-two punch is found not in the drivetrain, but surrounding it – the new body design is about 80 pounds lighter than the previous body, which was already one of the lightest in the class. The new lighter and tighter body is achieved through increased use of high strength and ultra high strength steel, the addition of a larger front tower strut brace (as used in sports cars like the Nissan 370Z), and a new rear structural support built into the rear pass-through/parcel shelf. As for the engines, a choice of two proven Altima powerplants – the 2.5-liter DOHC 4-cylinder and 3.5-liter DOHC V6 – are again offered for the new model year. The 2.5-liter QR25 engine has been redesigned to be lighter and more efficient. It now includes variable valve timing on both exhaust and intake camshafts, and the new intake system opens the valves at a higher rpm to help keep the torque curve flat. Featuring cutting-edge technology such as a new thermoplastic resin intake manifold, this engine simultaneously produced more power despite being lighter. Horsepower has increased by seven to an estimated 182 hp (from 175 hp), while torque remains the same at 180 lb-ft (est.). The advanced, award-winning VQ35DE 3.5-liter V6 remains rated at 270 horsepower (est.) and 258 lb-ft of torque (est.). Helping increase fuel economy with both engines is the next-generation Xtronic CVT® (Continuously Variable Transmission). Nissan is an industry leader in CVT transmissions, with more than 20 years of experience in CVT design and engineering. For this next-generation design, a full 70 percent of the parts have been redesigned and internal friction reduced by up to 40 percent (versus the previous design). It also features new control logic and expanded gear ratio coverage, which helps reduce noise and fuel consumption while improving drivability and responsiveness. Targeted fuel economy for the Altima 2.5-liter 4-cylinder/CVT combination is 27 mpg city, 38 mpg highway and 31 mpg combined. Fuel economy for the 3.5-liter V6/CVT Altima is rated at 22 mpg city, 30 mpg highway and 25 mpg combined. Also contributing to the improved fuel efficiency are tires with reduced rolling resistance and a new regenerative alternator that only operates when the vehicle is coasting. Building on Altima’s reputation for superior dynamic performance, the 2013 Altima offers a redefined multi-link rear suspension benchmarked to leading European sports sedans. The design features high lateral suspension stiffness, improved toe angle control (with the addition of new connect bushings) and improved camber angle control under load (for increased tire contact with the road when cornering) versus the previous generation Altima. The suspension also utilizes a new shock absorber design by ZF SACHS, similar to that used on high-end luxury sedans, to deliver stellar body control and response, while simultaneously delivering a plush, comfortable ride. 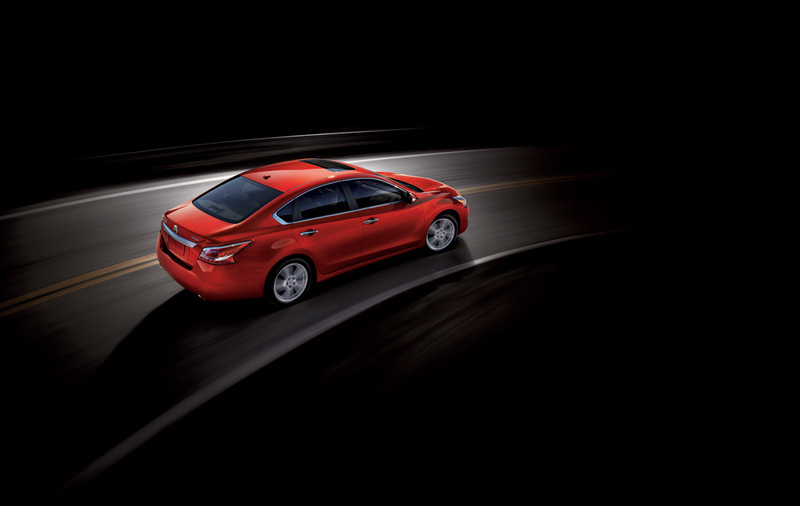 The 2013 Altima’s front suspension uses an independent front strut design. Stabilizer bars are utilized front and rear. Also used for the first time on a Nissan vehicle and in the segment is a new Active Understeer Control system, which utilizes intelligent control logic and high-response brake actuators to brake the inside front wheels during cornering (as required) to increase yaw-moment. Using the Vehicle Dynamic Control (VDC)/Traction Control System (TCS) as its base, Active Understeer Control is almost undetectable when it operates. It is designed primarily for everyday operation rather than emergency evasive maneuvers. “Our target, which we think we’ve achieved, is to provide outstanding levels of handling and comfort. The more secure and responsive the suspension, the less stress the driver should feel in nearly every driving situation,” added Carolin. Responsive steering is provided by a new Electronic Hydraulic Power-Assisted Steering (EHPS) system that preserves the feel of hydraulic steering rack while offering the efficiencies of an electric power steering set-up. Altima’s 4-wheel power-assisted disc brake system was also re-engineered utilizing human ergonomic studies to optimize pedal travel and force, providing a premium blend of immediate response, confident braking and reduced fatigue. Anti-lock Braking System (ABS) and Electronic Brake force Distribution (EBD) are standard. A selection of wheels and tires are offered on the 2013 Altima, including 16-inch steel wheels with full covers and 215/60R16 all-season tires, or 17-inch aluminum-alloy wheels with 215/55R17 V-rated all-season tires, on 2.5-liter models. New 18-inch aluminum-alloy wheels with 235/45R18 V-rated all-season tires are standard on 3.5-liter V6-equipped models. The team behind the development of the new fifth generation Altima didn’t stop with the major components and systems – they also made numerous, almost imperceptible enhancements to nearly every aspect of the driving experience. The headlights’ automatic-on function, for example, offers an improved two-stage function. In lower light situations during the day, the headlights illuminate automatically – but the gauges remain in daylight mode. In late evening/night conditions, the headlights remain illuminated and the gauges revert to nighttime lighting. In addition, many states now require the headlights to be illuminated in rainy conditions. In the all-new Altima, after four passes of the windshield wipers, the headlights turn on automatically. If the vehicle is turned off with the wipers in motion, instead of stopping mid-motion, they automatically complete a full cycle – so they don’t get frozen to the windshield in icy or snowy conditions. The team even paid extra attention to the armrests, equipping them with deep, plush padding in order to enhance comfort mile after mile. Available from the SV grade is a factory-installed Remote Engine Start System, which allows the owner to heat or cool the vehicle from the comfort of the home. The Altima must be locked for the remote start to operate (up to 10 minutes). The Altima’s remote start is the first offered with a Nissan vehicle. The 2013 Altima offers a long list of standard safety features, including Nissan Advanced Air Bag System (AABS) with dual stage supplemental front air bags with seat belt sensors and an occupant classification sensor, front seat-mounted side impact supplemental air bags, and roof-mounted curtain supplemental side-impact air bags for front-and rear-seat occupant head protection. The all-new 2013 Nissan Altima is offered in four 2.5-liter engine equipped models, 2.5, 2.5 S, 2.5 SV and 2.5 SL, along with three 3.5-liter V6 equipped models, 3.5 S, 3.5 SV and 3.5 SL. The Altima 2.5 S model includes 6-way power-adjustable driver’s seat, Advanced Drive-Assist™ Display, steering wheel-mounted audio controls, cruise control, Nissan Intelligent Key®, six speakers, auto on/off headlights, in-cabin microfilter, Tire Pressure Monitoring System with individual tire pressure readouts, and much more. Altima 3.5 S adds 18-inch wheels and tires, plus paddle shifters with manual mode. Altima SV models include Dual Zone Automatic Temperature Control, Remote Engine Start System, leather-wrapped steering wheel, aluminum-alloy wheels (17-inch on 2.5 SV, 18-inch on 3.5 SV), RearView Monitor, NissanConnectSM with Pandora® radio capability, SiriusXM™ Satellite Radio (SiriusXM™ subscription required, sold separately), 5.0-inch color audio display, USB port with iPod® connectivity, Hands-Free Messaging Assistant and more. The 3.5 SV also adds a moonroof, fog lights and HomeLink® Universal Transceiver. Altima SL models include leather-appointed seating, BOSE® Premium Audio System with nine speakers (including woofers), 8-way power driver’s seat, heated front seats and steering wheel, heated outside mirrors, LED taillights, LED outside mirror turn signals, premium interior trim, power sliding moonroof, auto dimming rearview mirror, and HomeLink® Universal Transceiver and more. Just three options packages are available: a Convenience Package (2.5 SV), Navigation Package (SV) and Technology Package (SL) – along with the optional Remote Start and Rear Spoiler. The new Altima, like previous generations, will be assembled in Smyrna, Tenn. And Canton, Miss., with engines produced in Decherd, Tenn.
FRANKLIN, Tenn. (April 4, 2012) – Nissan North America, Inc. (NNA) has announced U.S. pricing for the all-new 2013 Nissan Altima Sedan, which made its world debut at a press conference today at the New York International Auto Show. 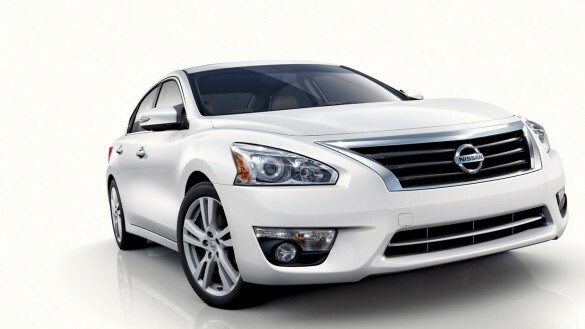 The totally redesigned fifth generation Altima, the most innovative Altima ever with premium “class above” exterior and interior styling and targeted segment-leading estimated fuel economy of 38 mpg*, will be available at Nissan dealers nationwide beginning in July 2012. 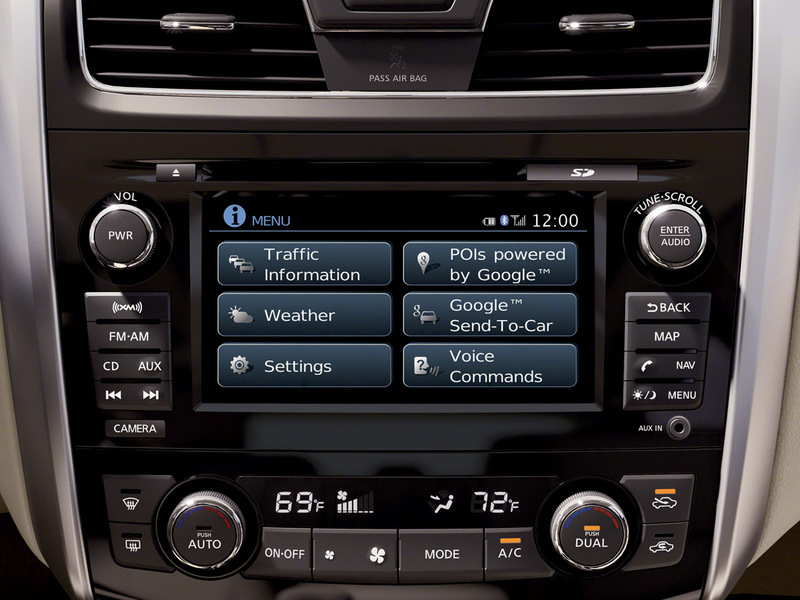 In addition to the new Altima’s extensive list of standard equipment, three special equipment packages are offered, including the Nissan Navigation Package (SV models) – featuring a 7.0-inch color display, steering wheel navigation controls, and turn-by-turn navigation integrated into the Advanced Drive-Assist™ Display – priced at just $590 USD. The Technology Package (SL models) includes the Nissan Navigation System, Blind Spot Warning (BSW), Moving Obstacle Detection (MOD) and Lane Departure Warning (LDW), features usually available only on more expensive vehicles. Also offered is a 2.5 SV Convenience Package. The Nissan Altima has come a long way in the 20 years since it was first introduced. Now, with the arrival in summer 2012 of the all-new fifth generation design, Nissan promises to shake up the mid-size sedan segment again with the most engaging, purposeful and energetic vehicle in its class. Among the 2013 Altima’s many attributes are a targeted best-in-segment* fuel economy of 38 mpg highway (2.5-liter engine), new premium exterior styling with a strong presence and excellent aerodynamics, an upscale interior with premium materials, and an outstanding balance of ride comfort, stability and a fun-to-drive demeanor with projected best-level acceleration. Building on Nissan’s “Innovation for All” philosophy, the new Altima also offers standard NissanConnectSM integrated smartphone connectivity with standard Bluetooth® Hands-Free Phone System, Streaming Audio via Bluetooth®, and available Hands-Free Text Messaging Assistant, Pandora®, real-time POIs Powered by Google®, Google® Send-to-car, Easy Fill Tire Alert, and next-generation Safety Shield Technologies, including Blind Spot Warning (BSW), Lane Departure Warning (LDW) and Moving Object Detection (MOD) systems. Dynamic performance is provided by a choice of a redesigned 182-horsepower (est.) 2.5-liter DOHC inline 4-cylinder engine or a proven 270-horsepower (est.) 3.5-liter V6, with both engines matched with standard Xtronic CVT®. Altima’s next-generation CVT reflects Nissan’s more than 20 years of engineering and development leadership with its smooth, fuel-efficient design. Altima’s redesigned 4-wheel independent suspension features segment-first Active Understeer Control for refined feel and responsive handling. The premium interior design looks and feels a class above, with new NASA-inspired “zero-gravity” front seats, available leather appointments, and a new standard Advanced Drive-Assist™ Display in the center of the instrument cluster that integrates key information – including available navigation, text messaging notification and audio data – right in front of the driver. The 2013 Nissan Altima is offered in seven well-equipped models: Altima 2.5, 2.5 S, 2.5 SV, 2.5 SL, 3.5 S, 3.5 SV and 3.5 SL. The new Altima is assembled in the United States. In North America, Nissan’s operations include automotive styling, design, engineering, consumer and corporate financing, sales and marketing, distribution and manufacturing. Nissan is dedicated to improving the environment under the Nissan Green Program 2010 and has been recognized as a 2010 and 2011 ENERGY STAR® Partner of the Year by the U.S Environmental Protection Agency. More information about Nissan in North America and the complete line of Nissan and Infiniti vehicles can be found online at www.NissanUSA.com and www.Infiniti.com. Nissan Motor Co., Ltd., Japan’s second largest Japanese automotive company by volume, is headquartered in Yokohama, Japan and is an integral pillar of the Renault-Nissan Alliance. Operating with more than 150,000 employees globally, Nissan provided customers with more than 4 million vehicles in 2010. With a strong commitment to developing exciting and innovative products for all, Nissan delivers a comprehensive range of fuel-efficient and low-emissions vehicles under the Nissan and Infiniti brands. A pioneer in zero emission mobility, Nissan made history with the introduction of the Nissan LEAF, the first affordable, mass-market, pure-electric vehicle and winner of numerous international accolades including the prestigious 2011 European Car of the Year award. For more information on our products, services and commitment to Sustainable Mobility, visit our website at http://www.nissan-global.com/EN/.